I have an 8 yr old Japanese maple that is planted in a whiskey barrel the same amount of time . It gets morning light until noon ,it is quite happy in the location it is. In the years the majority of the soil has washed and many of the roots are exposed. I know I have to re freshen the soil but do not know how to go about that. I don't want it to go into shock and risk losing it. Any advice ?? You are right about not disturbing the plant now. 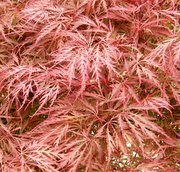 Repotting is better done in early spring before your Japanese Maple tree starts growing leaves. Exposed roots are not good for your maple tree though. For now just remove any loose soil from the top without doing too much damage to the root system. Refill with fresh potting soil. You can mix a slow release fertilizer into it if you like. Then water the new soil in. Next spring you can carefully lift the plant out of the container. Gently shake off all the loose soil. Refill some fresh soil into the bottom of the barrel. Put the root ball back on to it and fill new soil around it. Make sure to leave no pockets when filling it up again. Firm the new soil in and water till the water runs out at the bottom of the pot. This will ensure that the soil gets washed into little pockets and onto the roots.